A squared plus b squared equals c squared. It sounds simple, doesn't it? Yet this familiar expression opens a gateway into the riotous garden of mathematics, and sends us on a journey of exploration in the company of two inspired guides, Robert and Ellen Kaplan. 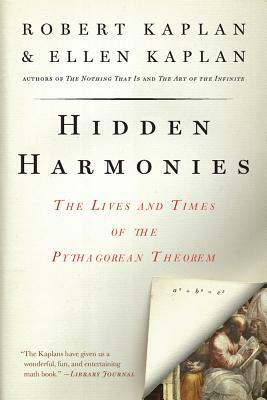 With wit, verve, and clarity, they trace the life of the Pythagorean theorem, from ancient Babylon to the present, visiting along the way Leonardo da Vinci, Albert Einstein, President James Garfield, and the Freemasons-not to mention the elusive Pythagoras himself, who almost certainly did not make the statement that bears his name. As in the authors' bestselling The Nothing That Is and Chances Are..., the excitement of mathematics leaps from the pages of Hidden Harmonies. Ellen Kaplan has taught mathematics to people from six to sixty, at leading independent schools and most recently at Harvard University. With her husband, Robert, she wrote The Art of the Infinite. Ellen is also co-author of Chances Are: Adventures in Probability and Bozo Sapiens: Why to Err is Human, co-written with her son, Michael Kaplan.